What kind of colour is Wool Skein? Wool Skein is a light neutral beige/tan paint colour. It’s warm without being overly yellow/orange toned like SW Softer Tan, yet it’s not as neutral (slightly gray) as SW Natural Tan. What are the undertones of Wool Skein? Now, if you’d been planning on painting your walls in Wool Skein, THIS is where you might change your mind. Wool Skein is ‘generally speaking’, a beige that leans just slightly into yellow – sounds good, right? Sure, until you realize there’s also a weeee willy wink o’ green in there. That’s right – green. 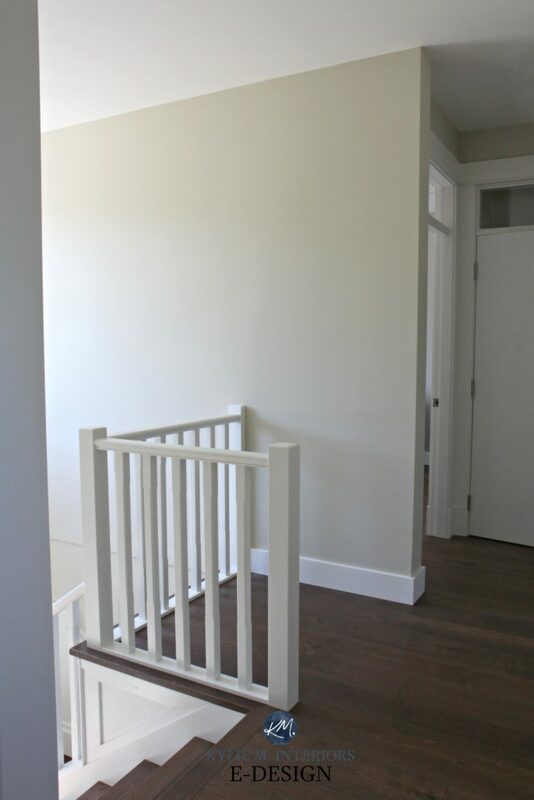 It’s not a green that’s obvious or even NOTICEABLE – on some walls. However, for those of you that are a bit more colour-sensitive, you might find that that sneaky undertone isn’t what you are looking for in your perfect warm neutral. What is the LRV of Wool Skein? Wool Skein comes in at an AWESOME 63 – just one smidge off of my best LRV for any room. So, at 63, it isn’t necessarily going to lighten and brighten a dark space, but it also won’t weigh it down too much as long as you have adequate interior lighting. If you have an OVERLY bright wall/room, it will wash-out just slightly, but only when the sun is directly on it (as shown on the upper walls in the above photo). What is the best trim colour for Wool Skein? Wool Skein is relatively flexible, as long as it’s a warm, soft white. In the home shown below, we chose Cloud White, darkened by 25%. We did this same colour on the kitchen cabinets as well (mad love). So, now that you know ALL ABOUT Wool Skein, are you still excited to use it? If not, I’ve got a few more for you to check out! Not sure which beige is best for you? Check out my affordable and fun E-design and Online Paint Colour Services! I actually love this color but you never hear people talking about it….till you in this post! I have this color in my living room. I have Simply White on the trim. I get the morning light (when it just appears to be a warm white) and looks slightly creamy in the afternoon shade. It pairs beautifully with my white linen draperies, jute rug and white sofa. I really like it. Gives some warmth to the room but still very light. I love to hear that Linda! And Simply White probably looks SUPER gorgeous with it, good choice! I happen to have this exact shade in my living room too with the jute rug and white sofa. 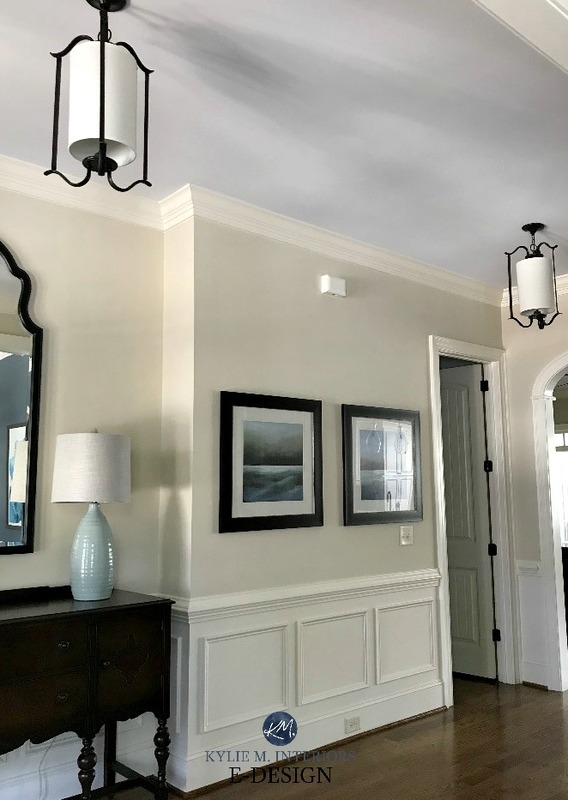 Its an east facing room and I personally like the way it gives a subtle warmth to my Simply White trim and soft white draperies. It pairs well with many grays and the blue of my chairs. I had never heard of the color Wool Skein before I picked it out myself. We just used Wool Skein as an exterior body color, trimmed out with BM Copley Grey. We’re pleased with it! Paired it with BM Narragansett Green on front door and SW Copen Blue on porch ceilings. I dont miss a post of yours.. Just awesome…. I have been considering it as my paint choice in the new house we are building. I use my own tint choice for the trim and was excited by your tinting cloud white for the trim with wool skein. My question is what is a good floor color if I am going with a Pergo engineered wood.? My decor is Traditional with lots of antique mahogany and walnut. I lean toward green. Is Wool Skein a good choice for my kitchen walls if I have stainless still appliances and gray counter top? Love your blog! Can’t wait to use your consulting services for my new home! You’ll be hearing from me once I settle in! How would this look in a kitchen with medium/light cherry cabinets and does it play well with palladium blue in an adjacent room? Thanks! Oooo, I might not do it with Palladian, Palladian might be a bit too colourful/cheery and could clash with those tricky undertones of Wool Skein! I discovered Wool Skein by pure dumb luck in 2015 when I redecorated my east facing great room in earth tones (fabrics in leafy greens, sandy tans, and bronzy browns, with shiny accessories of cobalt blue glass, and gold tones for the picture frames and light fixtures). The room has large windows a view of hardwood trees close by. The sunlight light filters through the leaves all morning in summer, which works well with the slight greenish tinge of the paint. I extended the color into the breakfast room and kitchen, which also face east windows as part of an open floor plan, when I took down the dated kitchen wallpaper the following year. Wool Skein turned out to be good neutral to use with honey colored wood cabinetry. Ya done good Eliza! Wool Skein sounds like the PERFECT option for your home, I bet it looks friggin’ gorgeous! I painted my entire house, save the bedrooms, in Wool Skein. It was a fantastic color and lightened up my space (severe lack of natural light) magnificently. I had tan/creamy/slightly pink ceramic tile, and medium to dark cabinets and it paired beautifully. I think it also helped that I had cream furniture that kept it firmly in the cream/beige camp. Surprisingly, though, after reading this post I never noticed the green even with a bright teal media cabinet on my main living room wall for years. It’s a fantastic color in the right space, though, and I’m so excited as a first-time peruser of your blog to see you write about it! This is one that I never see mentioned much and it deserves some love. Jackie, THANK you. Reading comments like yours is SO helpful to other readers – and I’m glad you found me! I do color consults for Sherwin Williams and Wool Skien is one of my favorite “what am I?” colors. Definitely be careful/cognizant of the green undertone but it is a gorgeous color, super cool next to blues or warmer whites. Love your posts, how would wool skein go with stonington gray ? Trying to pick a color to replace straw hat currently in my livingroom adjacent to stonington, would this work? Never heard of this color before, as I generally stick to the BM colors? Would love to know your opinion? Thanks Kylie my other choice is ballet white by BM, what do you think of it along side stonington gray? Loving your blogs and LRV videos, great info, you could have a decorating/color mapping TV series, very impressive, and informative! I have wool skein in my living room , family room and hallway. I was going to also use it in the dining room and kitchen (natural cherry cabinetry) but realize it’s too much of the same color. I was thinking SW sea salt for the other rooms, soft green, but is it too pastel ? (I don’t want pastel). What neutral green or maybe blue would you pair wool skein with ? Thank you ! If I use SW Studio Clay as main exterior and Wool skein as trim on a contemporary house….does that sound off? Would you pair it with a warm grey or not? Thank You! Just bought your exterior paint package!! What color “white” paint cabinets do you think would pair best with Wool Skein? Something in the cream family, such as a Shoji White/Divine White/Cloud White? Or are their shades too close? Hi Nancy, I do like Shoji White, it looks quite beautiful! In one home we partnered it with Cloud White and I loved the warmth it brought. Thanks so much! We are in the process of painting our cabinets right now and decided on BM white dove. My favorite color choice against them in my north facing living room/kitchen is Wool Skein! We have a ton of greenery in the back yard and with all the natural light it looks really warm and inviting with the white cabinetry and brown granite. Our entire first floor is pretty open so I’m going to be painting the entire downstairs that color. I’m wanting to add in a pop of something else. Maybe in our dining room where we have a tray ceiling. Can you recommend a favorite complimenting color to go with Wool Skein? Love your blog and have been referencing it a ton the past couple months! My kitchen and dining room are combined and the walls are painted in Wool Skein. My kitchen cabinets are currently just plain 90’s oak cabinets, but I will be painting them gray within the next few weeks. BM Revere Pewter is the color I wanted for the cabinets, but I don’t think it will look good paired with Wool Skein. Do you have a recommendation for a gray that will work well with Wool Skein? Off the top of my head, I have to say that I’m not a BIG fan of Wool Skein with grays, simply because Wool Skein is a beige with those sneaky green undertones, making it harder to partner it up nicely wiht a gray, especially without knowing the countertop/flooring. I’m thinking of using this color on a west-facing sunporch, with buttery yellow and sage green accents. Do you think this would work? Hi Kylie. We are building a home and it’s the first time I’ve really had the opportunity to decorate a space. Your blog and videos have been so helpful. After much research and deliberation we have chosen Wool Skein as our neutral. We have an open floor plan and for the most part I love it! It really is a mushroom chameleon. However, there are a few spots that look undeniably pink at certain times of day (which took me by surprise as I didn’t find that in any of the reviews I read.) While I could probably live with it, the pink makes my husband pretty grumpy. Any recommendation for accent wall or decor colors to deter the pink undertone? TIA! Hmmmm, the only reason why I can think it would go pink would be a reflection as it’s like, the anti-pink colour! Do you have a red couch, red exterior siding out the window or brick? Something that could be reflecting on that wall???? No! Part of why I chose wool skein is because of what I read on line was that it didn’t have any pink undertones. It is so crazy. We don’t have brick, our vinyl is clay with brown shutters. Inside we have brown carpets, dark brown laminate, and ‘barnwood’ cabinets. The carpet hadn’t been installed when the walls were first painted and it has helped diminish the pink. This is a new construction and we haven’t added any furniture. I’m drawn to greens and browns for decor. I was thinking about doing an accent wall or two in a green like, dried thyme. Do you think that would help? The big surprise for me – just FYI – is how clearlly GRAY the color is. It barely resembles anything tan/beige at all – though I did see the green you mention sneak through in morning light (which, in truth I liked). I wish I could share a photo of the room. 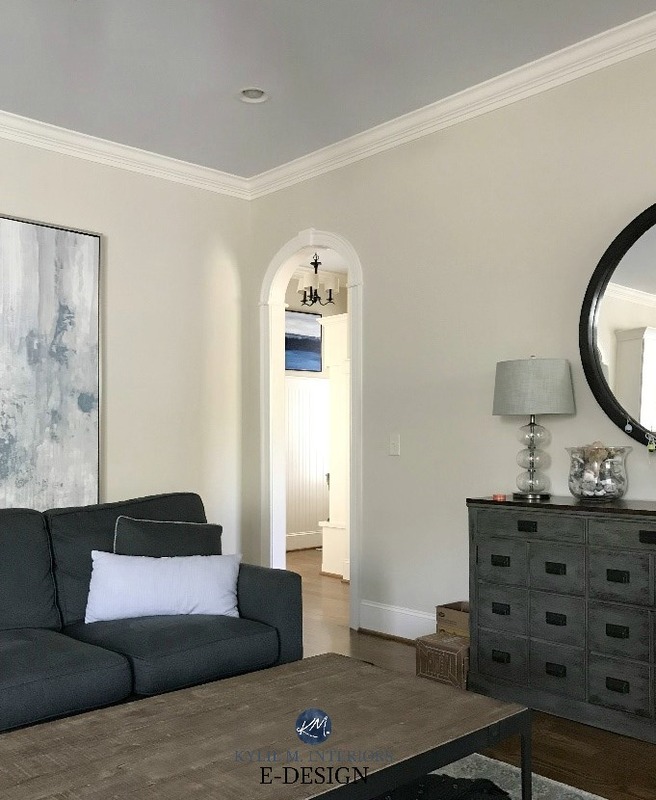 I’m satisfied with the color – but I’ve NEVER painted any room where the finished result was so dramatically different than expected. We are planning to use Wool Skein in the main areas of our new house. How do green colors such as SW Quietude work up against Wool Skein? Does the green pull out the green tint in Wool Skein? Hi Robyn! Wool Skein and Quietude can be okay together. And yes, Wool Skein might make Quietude look that wink more colourful in comparison! Hi Kylie, Love your blog and have purchased some e-design. 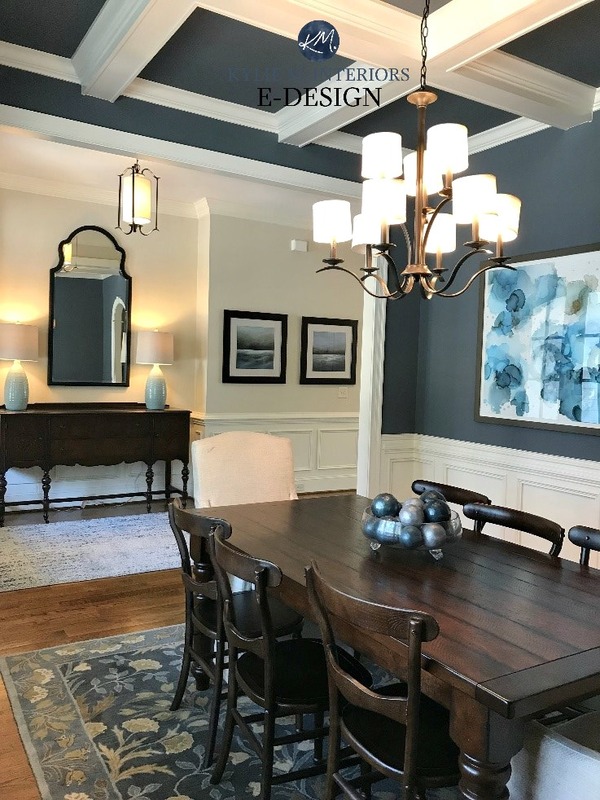 One quick question, what it that gorgeous blue paint they have used with Wool Skein on the dining room walls and ceiling? It pairs wonderfully! Hi Alise, that was SW Wall Street – it is pretty sweet! Wow, well thank you Alise, it’s SO appreciated! Wwhat trim and ceiling color did you use with the Wool Skein and Wall trees combo? Love it! Hi Becky, thank you – that was BM Cloud White darkened by 25%! Thanks so much for all your tips! I’m loving Wool Skein and thinking of using it on the walls in a north facing kitchen. 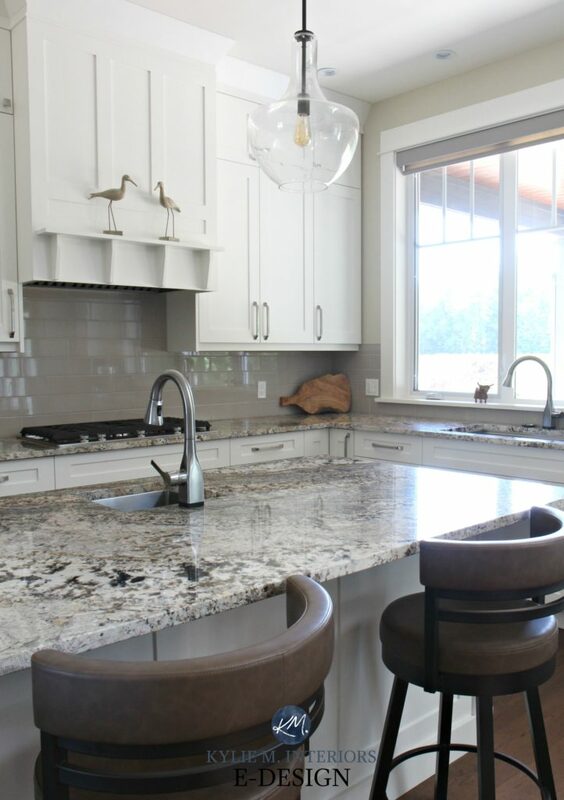 The counter tops are a granite very similar to the above photo (like St. Cecilia). The cabinets will be painted White Dove or Simply White. The PROBLEM is the showstopper tile floor that has a slight brown/PURPLE undertone that cannot be replaced). How will Wool Skein work with the purple undertones in the flooring?? ?